Foil baked salmon is a delightful treat that is very simple to make. Pair it with some seasonal grilled vegetables and a wine and you have a delicious gourmet meal. King salmon is large and quite valuable. This fish typically has white flesh rather than pink. Sockeye is also called red salmon. This fish that weighs between 6 and 9 pounds when harvested. This is the most popular Alaskan commercial fish. Coho, or silver salmon is often sold whole and it is commonly canned or smoked. Chum, also called dog salmon, has pale yellow meat. This is a less marketable fish. Pink, or humpy salmon is abundant and it is most frequently canned. Why Bake Salmon in Foil? Each packet can be customized to the individual. If one person dislikes red peppers, for example, this ingredient can easily be left out. Baking in foil creates steam, which offers rich flavor without adding fat and calories. The cooking process takes little time. The foil keeps the seafood hot before serving. Cleanup is easy, allowing more time for you to enjoy your evening. While little more is necessary than salmon steaks and olive oil, you have countless options for adding flavor to this seafood dish. 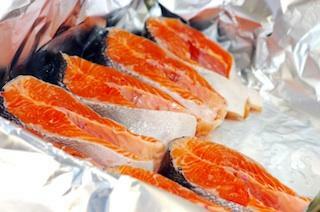 Cut a piece of foil big enough to wrap around the salmon while leaving a little room for extra ingredients and steam. Drizzle olive oil on the bottom of the foil and place an eight ounce piece of salmon on top of the oil. Add other ingredients according to the specific recipe. Bake at 450 degrees Fahrenheit for about 15 minutes. Cooking times may vary according to the size of the salmon steak and the recipe you choose. Serving options include plating the salmon on a warm plate or serving it in the foil packet presented on a plate. Take care when opening the foil packets. The steam is extremely hot and it can easily burn your skin. Many people enjoy the natural flavor of salmon with a hint of olive oil, lemon, salt and pepper. While this classic method of presenting salmon is wonderful, there are a plethora of recipes to consider. A sweet bourbon marinade is an outstanding option to consider. Though typically used in broiling cooking methods, marinating the salmon steaks in a sweet bourbon sauce offers a flavorful variation for foil baked salmon. Dissolve the brown sugar in the pineapple juice. Add bourbon, soy sauce and garlic and stir. Gradually stir in the olive oil. Marinate the salmon in the sauce for a few hours before placing in the foil packets. Consider using this recipe when broiling salmon, too. Use foil packets for nearly any salmon recipe you can think of. Foil baked salmon is a lovely canvas for countless culinary inventions. The simple cooking method is ideal for beginners but seasoned cooks can experiment with original ideas as well.